Yes. Our company is licensed, bonded, and fully insured. Yes. In almost all instances we offer a one year labor warranty. Do you provide free estimates on your services? Yes. We offer free estimates for plumbing repair or replacement items that do not require a diagnosis. How do I know if my heater or air conditioner is in need of repair? You may not be able to tell if your heater or air conditioner is in need of repair until it is too late. Bogush offers a seasonal start-up of your equipment in which a full diagnostic evaluation is performed. Upon completion of the diagnosis, any repairs we feel are necessary will be discussed at that time. Why is my toilet or shower overflowing? Your clogged fixture may be due to hair or sludge buildup. Sometimes this can be cleared with a simple snaking, or it may be a more serious problem. We recommend a Bogush service professional come to your home or business and evaluate the clog and recommend the proper repair. Bogush offers various finance plans, for those who are eligible, for boiler and water heater replacements. Give us a call and we would be happy to discuss more specific financing details. How often should I get plumbing check-ups? Bogush recommends you have your plumbing checked annually. We utilize a customized check list to help locate possible small leaks that can lead to large water bills down the line. Bogush employs its own staff members who are capable of performing carpentry, tile, and sheetrock projects, from anything from patchwork to large kitchen and bathroom renovations. How long does it normally take for your company to respond when I have a plumbing or heating emergency? 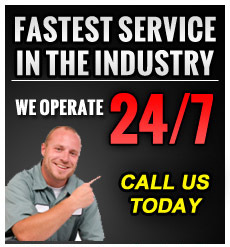 Bogush prides itself on some of the fastest respond times in the industry! When calling you will speak to a service professional on the phone, and your emergency call will be dispatched to one of our over 50 vehicles on the road. We normally can respond to any emergency for your home or business within one hour. Does your company also do air-conditioning? Yes. Our company has a complete HVAC division that can handle any air conditioning needs your home or business may have, from a simple start up to a complete system replacement. What can be done to help prevent my pipes from freezing in the winter? For your outside faucets turning off the water is key, but not enough. You must also disconnect the garden hose connected to the faucet to allow the water in the pipe to drain out. This will allow the piping to withstand the cold weather. For inside piping be sure you keep your heating thermostat set over 60 degrees at all times and open sink cabinet doors during extreme cold weather to help prevent freezing of the lines in outside walls. My pipes make a banging noise whenever I turn on or turn off my water. Is this causing damage? What can I do to stop the banging? Improperly secured pipes behind walls may be the problem. If the pipes are accessible, you can strap them with clamps so they can't bang against the structure. If your piping is metal and runs through holes in the joists or studs, then the problem may be expansion and contraction. As soon as either hot or cold water runs through pipes, they expand or contract, causing vibration and banging noises. Another problem is water hammer. This happens when you have high water pressure. Water moving in one direction does not want to stop flowing. When you shut off a faucet, the water still has some force, which has to be absorbed. When you shut off the faucet, the pipe will flex to absorb the force. A water hammer arrestor may be necessary to absorb the shock that is currently being absorbed by the water piping You may also have excessively high water pressure which can ultimately cause damage to your piping and plumbing fixtures. Any pressure in excess of 80 lbs requires a pressure reducing valve to be installed at your water meter, as well as a thermal expansion tank on your water heater. I am getting a foul odor from my bathroom. What can we do? Plumbing systems are designed to prevent sewer gas odors from entering the house by means of the trap attached to fixtures. Traps contain water to seal out the sewer gas. If the water seal evaporates, the sewer gas odor enters the house. To solve this problem, pour a bucket of water in each trap, sink, shower and floor drain. This will prevent the odors from entering the house. If the odor persists, you may have a cracked or improperly sealed pipe causing the odor. We would recommend a smoke test be performed. This is done by smoke being pumped into your plumbing system to visibly show where the sewer gas is coming from.